Outfit Stations are successors to the Dye Stations. Through Outfit Stations you are able to use the Outfit System, which allows you to alter the appearance of worn armor and dye weapons in addition to the standard dyeing of costumes and apparel. 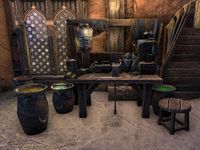 They replaced Dye Stations in the world and can be purchased for player-owned housing although Dye Stations are still available to purchase for a much lower price and provide exactly the same services. Yellow banners with the triskelion outfitting insignia have been added around some locales, which make the station easier to spot in crowded or dimly lit areas. This page was last modified on 4 July 2018, at 04:29.